This new volume brings together the essays from the 2005 Edinburgh Dogmatics Conference. The quality and diversity of contributors are impressive: there are essays by biblical scholars (N. T. Wright, Pierre Berthoud, Don Carson), scholars of historical theology (Paul Helm, Oliver Crisp), Barthian dogmaticians (John Webster, Bruce McCormack), and leading British and European theologians (Henri Blocher, Stephen Williams, David Wright, Donald Macleod). All of them are engaged in thinking or re-thinking specific aspects of the doctrine of God’s being and attributes. With such a range of contributors and topics, the book will have something for everyone. But the real centrepiece of the volume is Bruce McCormack’s masterful and wide-ranging essay on “The Actuality of God: Karl Barth in Conversation with Open Theism” (pp. 185-242). At nearly 30,000 words, this is virtually a monograph in its own right – and the book is well worth its price-tag for this essay alone. The essay is a stunning intervention in the North American debate over open theism. McCormack sees exactly what is at stake in the debate, but he refuses to allow the debate to be conducted along the usual lines. He acknowledges that open theists (Clark Pinnock, John Sanders, et al.) have identified a real problem in the classical theistic doctrine of God, but then he transposes this problematic into an entirely different register, insisting that what it is really needed is a properly christological approach to the doctrine of God. The problem with open theism is that it is not nearly radical enough; it critiques certain features of the classical-theistic doctrine of God, but never risks a fundamental break with the metaphysical apparatus of classical theism. This is why open theists finally prove incapable of resolving the doctrinal problems which they themselves have (rightly) identified: in spite of all their criticisms of “classical theism,” they continue to play the same game and to abide by the same metaphysical rules. In contrast, McCormack argues that Karl Barth had already identified the same basic problems, but that Barth produced a fundamental break with the whole metaphysical structure of the classical doctrine of God’s being and attributes. For McCormack, the crystallising moment at the core of Barth’s theological project is the revision of the doctrine of election. Here, Barth advances the thesis that God’s own primal decision “stands at the root of God’s being or ‘essence’” (p. 210). The event in which God chooses to be “God for us” is identical with the event in which God “gives himself his own being.” And this event of election is not located in any timeless eternity. God’s eternal decision coincides with the temporal event in which this decision reaches its goal. This coincidence – this event of utter singularity – is God’s being. Time, then, “is not alien to the innermost being of God” (p. 222). The time of Jesus Christ is the time of God’s decision – it is the primal time, the time of God’s eternal movement into history. There is no still-more-primal divine being which lurks behind this movement into history; God’s being is this movement, this effectual decision. In a nutshell (if I can put it rather crudely): it is because of the man Jesus that God is God. McCormack’s reading of Barth, and his response to open theism, unfolds as a gripping and commanding piece of theological reflection. McCormack is not merely repeating Barth in all this; he probes Barth’s thought sensitively but relentlessly, thinking with Barth and engaging him in critical dispute. In McCormack’s view, there are internal inconsistencies within Barth’s work, and the task for contemporary dogmatics is to carry forward Barth’s own best insights in order to produce a radically revised and re-imagined theological ontology. McCormack’s metaphysical proposal has, of course, met with considerable criticism in recent years (for example, here and here). Indeed, a curious feature of this book is the fact that the editor comes under fire even from one of his contributors! Paul Helm’s chapter on “Calvin and the Hiddenness of God” aims to critique Barth and McCormack from the standpoint of Calvin’s theology. 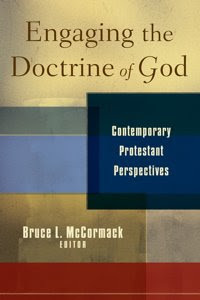 But when Helm counters McCormack’s theological ontology with the argument that “the act of electing is the act of a someone; it cannot be an act of no one which, upon its occurrence, constitutes a someone” (p. 79) – an argument like this reminds us how deeply ingrained, how apparently self-evident, these metaphysical assumptions are. In a debate about the relation between being and decision, it is of course merely question-begging to insist that a “being” necessarily pre-exists its own decision. But the fact that such metaphysical assumptions run so deep – strictly regulating what counts as reasonable and coherent in Christian talk about God – indicates the extraordinary importance and drastic implications of Bruce McCormack’s proposal. Even those who finally disagree with McCormack should not fail to see that his work represents one of the most searching, creative and doctrinally far-reaching projects in contemporary theology.